The Tool Options provides oodles of other options when you’re making Marquee selections. Some of these options allow you to make precise selections by specifying exact measurements. Others enable you to make soft-edged, feathered selections. You must select the options in the Tool Options, as shown in Figure 1-3, before you make your selection with the Marquee tools. The only exception is that you can feather a selection after you have created it. Feather: Feathering softens, or feathers, the edges of a selection. The amount of softening depends on the value — the higher the value, the softer the edge. The radius measures how far in all directions the feather effect extends. You can use small amounts of feathering to create natural transitions between selected elements in a collage. Use larger amounts to create a special effect where one image gradually fades into another. If you just want a selected element to have a soft edge without the background, choose Select→Inverse and then delete the background. To feather while you’re selecting, select the Feather option in the Tool Options before you use the Marquee tools. You can feather a selection after the fact by choosing Select→Feather. Anti-aliasing: Whereas feathering completely softens edges, anti-aliasing just slightly softens the edge of an elliptical or irregularly shaped selection so that extremely hard, jagged edges aren’t quite so prominent. 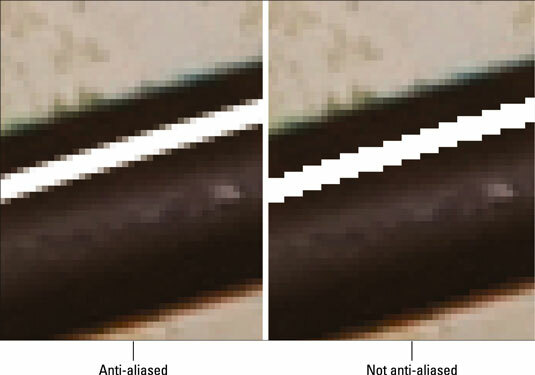 An anti-aliased edge is always only 1 pixel wide. Keep the Anti-aliasing option selected, especially if you plan on creating collaged images. Anti-aliasing helps create natural-looking transitions and blends between multiple selections. However, if you want a supercrisp edge, deselect this option. Normal: This option enables you to freely drag a selection to any dimension. Fixed Ratio: This setting allows you to specify a fixed ratio of width to height in a selection. For example, if you enter 2 for width and 1 for height, the Marquee selection you create is always twice as wide as it is high, no matter what the size. Fixed Size: This setting lets you specify values for the width and height. It comes in handy when you need to make multiple selections that must be the same exact size, such as in a school yearbook. Note that the marquee is immediately drawn when you click your canvas. The click point is the top-left corner of the marquee. Width and Height: When you select Fixed Ratio or Fixed Size from the drop-down menu, you also enter values in the Width and Height text boxes. To swap the Width and Height values, click the double-headed arrow button. Even though the default unit of measurement in the Width and Height text boxes is pixels (px), you can enter any unit of measurement that Elements recognizes — pixels, inches (in), centimeters (cm), millimeters (mm), points (pt), picas (pica), or percents (%). Enter the value and then type the word or abbreviation of a unit of measurement. The Refine Edge option is also available, but you most likely won’t need it for a selection made with the Marquee tools.